Russian Journal of Nondestructive Testing is a journal that describes current research on the theory and technology of nondestructive testing of materials and components. It describes laboratory and industrial investigations of devices and instrumentation and provides reviews of new equipment for batch production. Articles cover all physical methods of nondestructive testing, including magnetic and electrical; ultrasonic; X-ray and Y-ray; capillary; liquid (color luminescence), and radio (for materials of low conductivity). 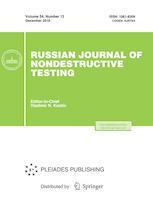 Russian Journal of Nondestructive Testing is a peer reviewed journal. We use a single blind peer review format. Our team of reviewers includes 102 reviewers, both internal and external (73%), from 8 countries (Russia, Ukraine, Belarus, Latvia, Kazakhstan, Slovenia, Bulgaria, Germany). The average period from submission to first decision in 2017 was 7 days, and that from first decision to acceptance was 60 days. The rejection rate for submitted manuscripts in 2017 was 40%. The final decision on the acceptance of an article for publication is made by the Editorial Board.